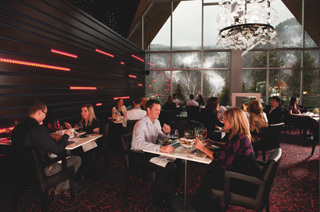 Edward and I had dinner at Altitude Seafood and Grill - Lounge Restaurant at the top of Mont-Tremblant in late February 2011 and had the opportunity to get to know Chef Christian Bolduc and his culinary vision. 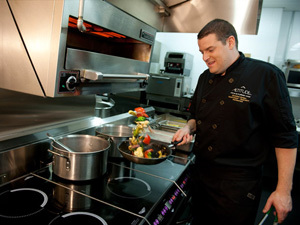 A native Quebeçois, Chef Christian Bolduc was born in Cantley near Ottawa-Gatineau, honed his culinary skills first at the École Hôtelière de Buckingham, and later apprenticed at the restaurant, Le Sans-Pareil, in Hull, Quebec where he learned the art of Belgian epicurean cuisine. He traveled to Europe and worked at restaurants in Belgium and Switzerland before returning to Canada. In 2004, he joined the Five Diamond team at Casino du Lac-Leamy's Le Baccara as the sous chef, and moved to become the Head Chef of Altitude Seafood and Grill - Lounge Restaurant at their sister property, Le Casino du Mont-Tremblant, where he was involved in the opening in September 2010. His culinary philosophy is very straightforward and honest. He likes it when his food tastes great and his guests are happy. Quebec has an interesting variety of local products and he enjoys working with the produits du terrior. Although he does not use local products exclusively, he finds that they are often the freshest and the best available so he uses them whenever he can. His favorite product is pork, in all its forms, as it is very versatile and always satisfying. He is also enjoying developing new and interesting approaches to preparing and presenting seafood for his clients. He loves the winter season because it gives him the freedom to serve up some big, hearty, comfort food. Since winter is the busiest season in Mont-Tremblant, he has the opportunity to deliver bold and flavorful meals to people coming in after a day spent on the mountain. When not at work in the kitchen he enjoys fishing, however his family is his number one priority and he enjoys spending time with his partner and his two daughters ages 5 and 18 months. As for whether or not there are any budding chefs in his family, it is a little too early to tell. He says that for now at least, they seem to enjoy his cooking. 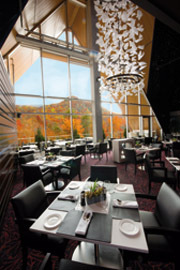 Until you can experience Altitude Seafood and Grill - Lounge Restaurant at Le Casino de Mont-Tremblant in Canada for yourself, enjoy a delectable taste of the restaurant with Chef Christian Bolduc's recipe for Atlantic Salmon Trilogy. Bon Appétit! Method: Rub the marinade on the salmon filet and let sit in the refrigerator for 12 hours. Check the firmness and marinate longer if required. Dry for 24 hours and cover with citrus confit (see below). Method: Place in siphon with two cartridges. Method: Cube the beets and cook sous-vide (vacuum sealed in water around 140° F (60° C) with thyme, salt, and pepper. Once beets are cooked, place in a Thermomix (or blender) with sherry vinegar and mix in olive oil. Process until smooth. Method: Blanch zests from the lemon four times and place in water with sugar. Boil to make a thick syrup for the citrus confit and coat gravlax with the confit, reserving a little confit for the presentation. Presentation: Using the beet purée, create a tear shape on the plate and place approximately 1.4 ounces (40 grams) gravlax and goat mousse with some green salad. Finally create a salmon tartar by finely cubing 2 ounces (60 grams) of fresh salmon with 1 teaspoon (5 grams) capers and pickles, 2 teaspoons (10 grams) of apples cut "en brunoise" (first julienne, turn a quarter and dice to produce cubes about 0.12 inch (3 mm or less) on each side of the cube.) Add olive oil, salt, and pepper. Form into a lovely quenelle (use two spoons to create a football shape) and add the citrus confit. 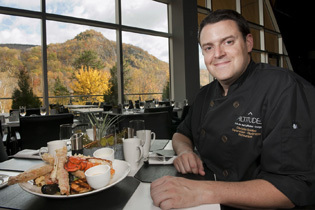 Read about Altitude Seafood and Grill - Lounge Restaurant at Le Casino de Mont-Tremblant in the Restaurants section and the Chefs' Recipes section where Chef Christian Bolduc provides the recipes in French .